I just love recipes that are quick and easy, yet still make dinnertime seem like a special occasion. A homemade meal that reminds you of something you might get in a restaurant (but without the extra expense.) This recipe for these super-flavorful Coconut Chicken Tenders is one of those kinds of recipes. 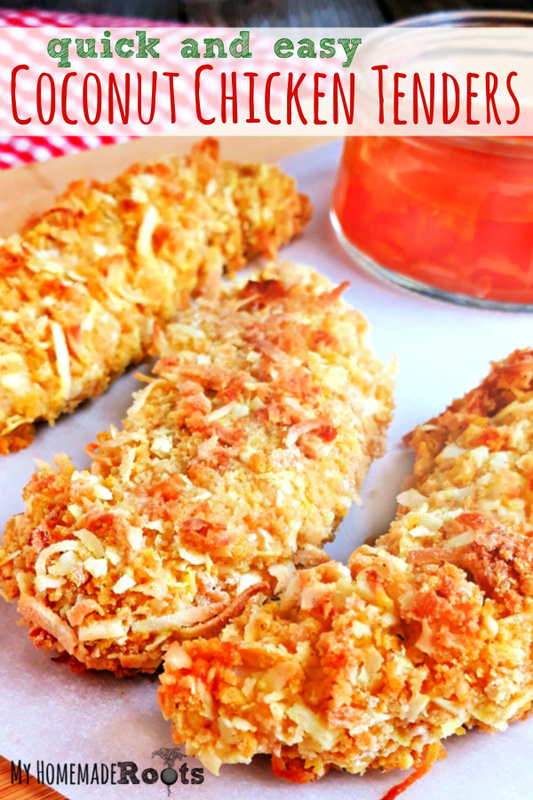 Tender, juicy chicken with a crunchy coconut breading, baked in the oven and on the table in less than 30 minutes. 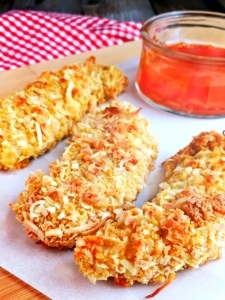 My husband, who isn’t even much of a coconut fan, loves these chicken tenders. And I love making them because not only are they delicious and family-pleasing, but they require only a few, simple ingredients that I normally have on hand. And I’ll just go ahead and admit that another reason I love this recipe is that clean-up is a breeze. Since I use a shortcut in breading the chicken (with 2 steps instead of the usual 3) there are fewer dishes and less mess. These tenders are also baked in the oven instead of fried, which also cuts down on kitchen clean-up. And let’s not forget the dipping sauce here. 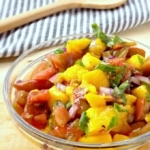 Super easy and full of mango flavor, with as much or as little spiciness as you like. Just 3 ingredients and it takes only a minute to prepare. Although I normally bake these tenders, you can fry them to make them extra super-delicious. I like to use coconut oil or avocado oil and shallow fry them in my cast iron skillet. When baking chicken tenders, line your baking sheet with non-stick foil for easy clean-up. Pie plates work perfectly as shallow bowls for your breading station. No mango jam to make the dipping sauce? Go ahead and substitute apricot or peach jam or preserves. If you like your chicken tenders extra-crispy, place them on an oiled wire rack on a baking sheet before baking, or use an air fryer. 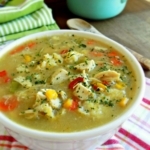 Try serving them with a side of roasted sweet potatoes, or yellow rice and black beans. If you manage to have leftovers, they are even good on a salad for lunch the next day. Heat oven to 400 degrees Fahrenheit. Spray a large baking sheet with oil and set aside. In a shallow bowl, whisk the 2 eggs until combined. In a second shallow bowl, combine the flour, coconut flakes, bread crumbs, powdered sugar, curry powder, and salt. Dredge tender in the eggs and and then into the coconut coating mixture. Place on oiled baking sheet. Repeat with the remaining tenders. Generously spray the coated chicken tenders with oil. Bake for 18-22 minutes, or under tenders reach an internal temperature of 165 degrees F.
In a small bowl, whisk together all ingredients until smooth and thoroughly combined. Why unsweetened coconut instead of sweetened? I usually keep unsweetened coconut on hand in my pantry. You can use sweetened coconut, I would just omit the tablespoon of powdered sugar. This sounds delicious! I love coconut shrimp but rarely think to put a similar topping on my chicken. Pinned. Thank-you! I hope you enjoy! Just pinned this awesome recipe and can’t wait to make it,delicious bites of goodness! Hope you are having a great week and staying warm. Thanks so much for sharing with us at Full Plate Thursday and come back soon! Thanks, Miz Helen! Have a great weekend!